Original: Emma put the tube in the centrifuge with the hinge on the outside and then waited for Ben from another group to put his tube opposite it. Then Emma turned the centrifuge on and set it to spin at 10,000 rpm for 5 min. Revised: The tube was centrifuged for 5 min at 10,000 rpm. 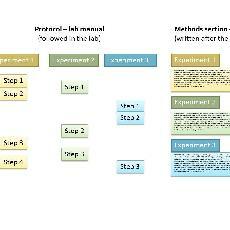 Your lab manual provides you with a protocol or step-by-step instructions for completing the experiments. When you come to write the methods section in your report you need to turn these instructions into a short narrative. Each experiment presented in the methods section should be mentioned in the results and discussion sections. Use informative sub-headings to help guide your reader through the methods section of your report. Click on the bars below to see examples of methods sections. 1. Wash and re-suspend red blood cells in isotonic saline. 2. Label 5 test tubes and fill with 1 ml of isotonic solution. 3. Add varying amounts of red blood cells (0-200 µl) to each tube. 4. Calibrate the LIM with the tubes and record the voltage output using Chart software. Written as a protocol rather than a narrative. Written as step-by-step instructions. Methods sections are normally written in the past tense because they describe events that have happened in the past. LIM acronym is not defined. Stock solutions of red blood cells (RBCs) were washed and re-suspended in isotonic saline. These cells were used as osmometers for investigating the membrane transport properties of cells. Changes in cell volume were measured using a light intensity meter (LIM) that gave a voltage output in response to changes in cell volume. The voltage was then recorded using the Power Lab system and the Scope and Chart software. The LIM was calibrated using test tubes of isotonic solution with varying volumes of RBC suspension (ranging from 0-200 µL) and recording the voltage output using Chart software. A calibration curve was constructed and used to determine the concentration of RBCs in an unknown solution. Written as a narrative in the past tense. 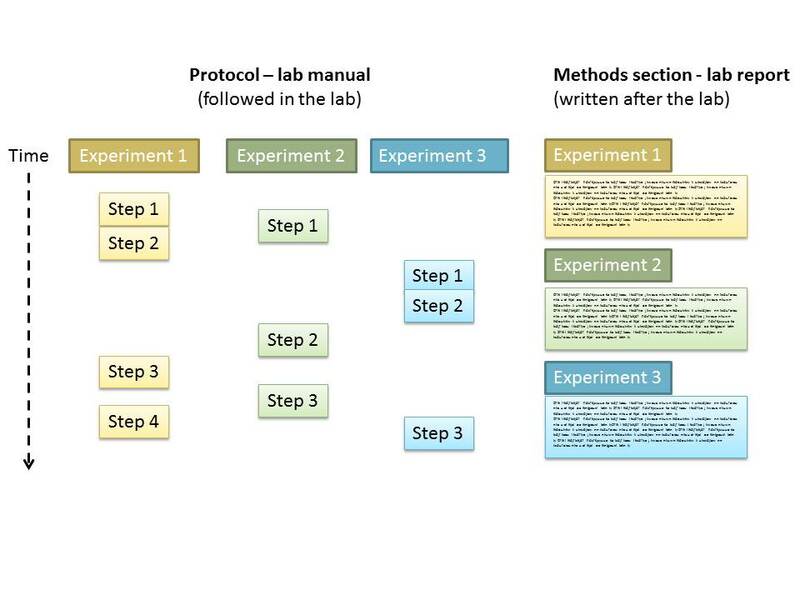 This method section summarises what was done in the laboratory rather than providing step-by-step instructions. It also gives more information as to why the experiments were being performed. LIM acronym has been defined. Emphasis is placed on what was done rather than who did it by using the passive voice. It is not wrong to use the active voice. What is important is the information is presented in a logical order that makes sense to the reader. Are the following sentences suitable for the methods section or for a laboratory protocol? 1. For all ECG recordings, the subject was lying supine, palms upturned and breathing normally. 2. Record the subject’s heart rate using the Finger Pulse Transducer (FPT) and Chart software. 3. Heart rate was measured throughout the experiments using the Finger Pulse Transducer (FPT) and Chart software. 4. Dilute 100µl of DNA in 100 mM phosphate buffer (pH 7.4).